Forces of all muscles within a muscle compartment are measured simultaneously. In the rat, extensor digitorum longus (EDL) crossess both the knee and the ankle. Therefore, it has both a proximal and a distal tendon. By measuring both forces simultaneously we can show that the muscle's connectivity to its surroundings can affect its force production. This leads to unequal proximal and distal forces. Therefore, the muscle's capacity to affect knee and ankle joint mechanics can vary depending on the functions of the other muscles in the compartment tibialis anterior (TA) and extensor hallucis longus (EHL). This view point is very helpful for understanding movement pathologies and the outcome of treatments. Muscle like all tissues is comprised of cells (muscle fibers) and the extracellular matrix (ECM). In muscle biomechanics it is a major issue to understand muscle fiber-ECM mechanical interactions as this is the key to muscle's function and adaptation. In order to analze that numerically, we have developed a specific finite element muscle model, which takes into accout these two domains and their elastic linkage. 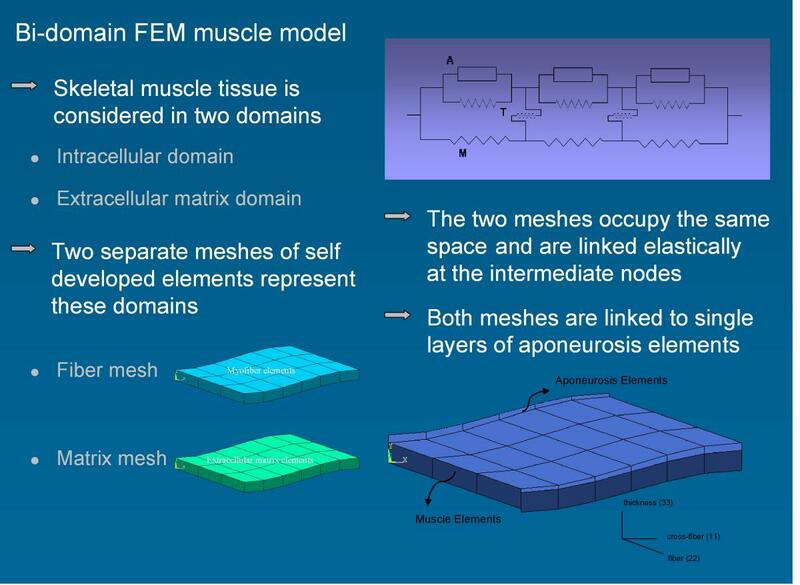 We made many high quality publications using this model which is called the Linked Fiber-Matrix Mesh Model. Muscle lengthening surgery (aponeurotomy) is one of the most widely applied surgical techniques in e.g., cerebral palsy patients. The tendon sheet over the muscle belly is transected and the joint it extended, which causes a tear in the muscle. The aim is to increase joint range of movement and if relevant, to decrease muscle force. We have simulated several aspects of this surgery using our finite element muscle model (Linked Fiber-Matrix Mech Model). One primary modeling aim was to understand the mechanism of effects of this intervention. Modeling shows by studying muscle fiber direction strain distributions that the part of the muscle distal to the location of intervention shortens substantially. This causes muscle's force production to decrease. On te other hand, muscle part proximal to the location of intervention shows strain heterogeneity (indicated by variation of color). This leads to an increased joint range of motion. The central aspect of this mechanism is related to altered lengths of sarcomeres within the muscle. 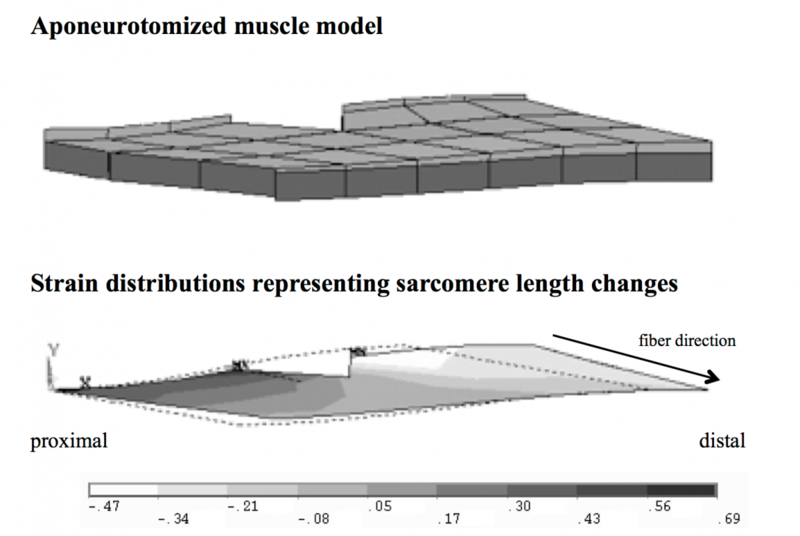 Sarcomere produce muscle force and determine motion. Their lengths is key to that function. Hence, assessment of this is highly important. During orthopedic surgery of children with cerebral palsy, we stimulate and measure forces of spastic muscles as a function of joint angle. This allows a unique assesment of the causes of limited joint motion of these patients. 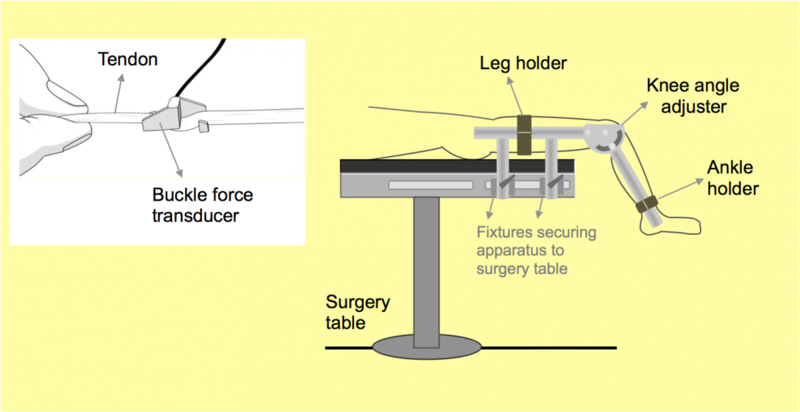 A special force transducer is used in this method we developed: the transducer is placed over the tendon without interfering with it. 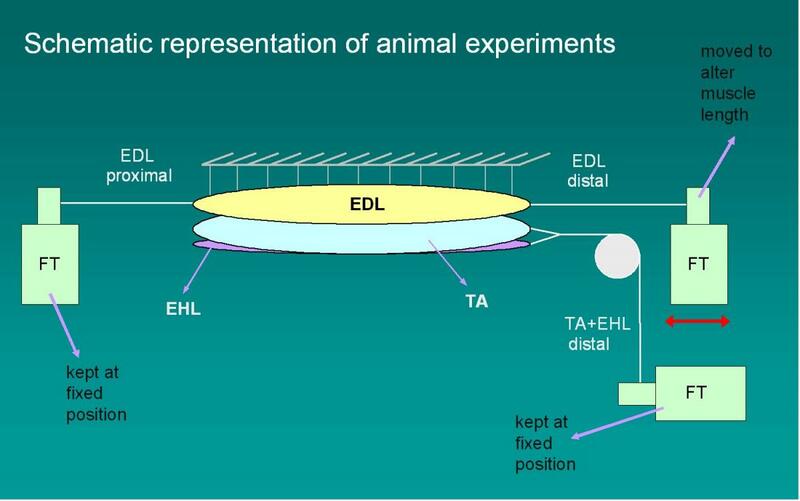 This allows the test conditons to be as close as possible to those in vivo. Therefore, clinically highly relevant data can be collected. MRI analyses allow calculating strain along muscle fibers in human muscles and in vivo. This is a major research tool we have developed. The picture illustrates strain distributions in the medial gastrocnemius muscle (red shows lengthening and blue shows shortening). The 3D recosntructed structures are the blood vessels and nerves to the muscle. This connectivity plays a role in the strain distributions shown. The Research Capabilities listed above are employed in combinations in order to address biomechanics problems particularly related to the musculo-skeletal system both computationally and experimentally. Research is conducted based on new viewpoints developed. A central issue is myofascial force transmission i.e., transmission of muscle force via structures coupling mechanically (i) muscle fibers and the extracellular matrix along the full length of muscle fibers and (ii) muscle to its surrounding muscular and non-muscular structures along the muscle belly. Due to such force transmission, our research groups have shown evidence that individual muscle fibers as well as individual muscles are not mechanically independent entities. This means that the force and movement production capacity of a particular muscle is not a unique property of it. Instead, such capacity is variable depending on the mechanical conditions within which the muscle functions. This has numerous implications for normal muscle function as well as for pathological muscle function. The Biomechanics Lab is interested in studying these implications and proposing new understandings for muscle performance in health and pathological conditions and for treatment techniques. i) Spasticity, aiming at improving the understanding of the mechanism of effects causing impeded joint function. ii) Remedial Surgery, such as muscle lengthening surgery in order to understand systematically the mechanical mechanism of effects within the muscle interfered as well as for other muscles. iii) Botulinum Toxin Injections, in order to quantify the length dependency of muscle force reduction effect and to understand its mechanism. iv) Therapies such as kinesio taping, aiming at understanding mechanism of effects objectively and in detail using magnetic resonance imaging analyses. XXI Congress of the International Society of Electrophysiology and Kinesiology (ISEK 2016 (http://www.isek.org/?page_id=230) will be held in July 5-8, 2016, Chicago, Illinois, USA. Dr. Yücesoy is organizing a symposium in ISEK 2016 which is entitled: Spastic muscle and its treatment using botulinum toxin: new wievpoints with major implications. The speakers of the symposium include Rick Lieber, Adam Shortland, abrina Lee, Filiz Ates, Rafael Fortuna and Can A. Yucesoy. Symposium motives are: Often global movement of the patients is studied in assessing effects of spastic cerebral palsy (CP) and effectiveness of spasticity management using botulinum toxin (BTX). Although this does offer an objective evaluation, the findings can be inconclusive or they are frequently inconsistent. This implies an insufficient control over the treatment of the movement disorder. This is in part ascribable to the heterogeneous conditions of CP patients. However, a major issue is that there is no sufficient understanding of the specific causes of the impeded joint movement, which may be obscured by the outcomes of the global bodily movement studied. Spastic muscle is still the motor for movement. Therefore, quantification of individual spastic muscle’s properties and measurement of its potential for affecting the joint mechanics is of key importance. On the other hand, a good understanding of the mechanism of effects of BTX on muscle mechanics and structure is crucial, but lacking. This treatment aims at reducing passive resistance, increasing joint range of movement and establishing a more balanced muscle force. Therefore, specifically testing of treated muscle’s stiffness, passive force, length range of active force production and mechanism of active force reduction is essential. This symposium will address these issues. Key symposium aims are the following: (1) Shedding light on the indicated gaps in our understanding by showing substantial data, (2) providing a platform for addressing different opinions among the speakers and (3) bridging specific muscle related findings back with the context of joint movement and suggesting new research directions. The speakers of this symposium have been engaging with direct research questions on spastic muscle and its treatment using BTX based on motives described above and showing remarkable findings, leading to new viewpoints with major implications. Their research involves various methodologies including additional to clinical assessments, intraoperative experiments on CP patients to measure forces of spastic muscles directly as a function joint angle, ultrasound techniques to identify structural muscle tissue adaptations and altered stiffness, animal experiments to specifically quantify BTX effects on muscle function and structure, and mathematical modeling to characterize mechanism of effects of BTX on muscular mechanics.